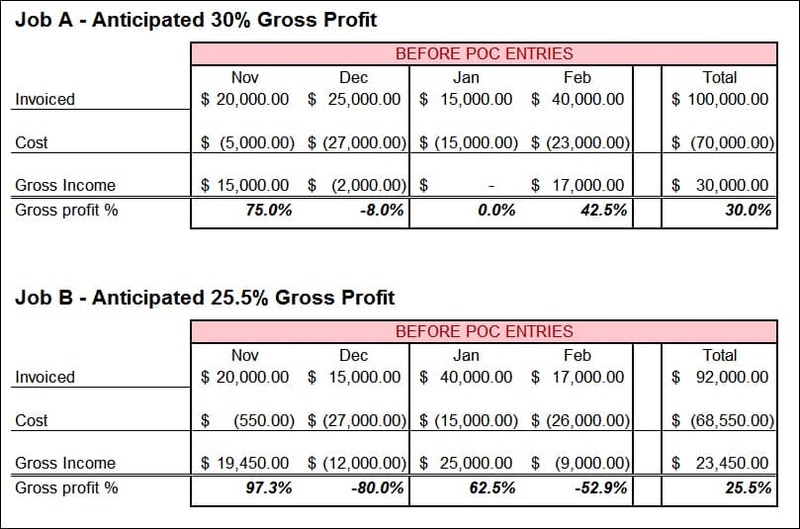 can reveal about your month-to-month profitability? Do you find that your gross profits and job profitability reports ‘swing’ dramatically from month-to-month? Are you guessing at your current (and future) company and job profitability? Do you know that you SHOULD make Percentage of Completion adjustments but find it too difficult or confusing? Do you have to wait for, and then pay your external accountant to make these critical entries? If so, you can use the Percentage of Completion Analyzer to accurately compute the numbers and provide the exact journal entries that you need in order to make these critical adjusting entries! More Than 130 Satisfied Customers! Just make your entries into the Analyzer for jobs in progress and it will then accurately compute your “over-billed” and “under-billed” amounts, job by job, and present results in a Journal Entry format – so that you can quickly and easily make the entries into your accounting system. Your job cost reports will instantly show your true monthly and life-to-date gross profit for each of your long-term ‘open’ jobs. This means that you will also be able to see a more accurate picture of overall company profitability. Stop the confusion and frustration over your Percentage of Completion adjustments! Now you can consistently make these entries on your own without paying for (or waiting on) an outside accountant. 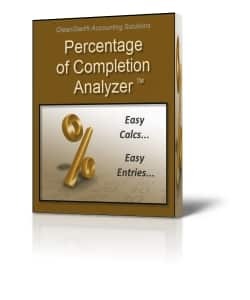 Your Percentage of Completion Analyzer also includes a User’s Guide, an overview of Percentage of Completion concepts, and sample calculations and entries. 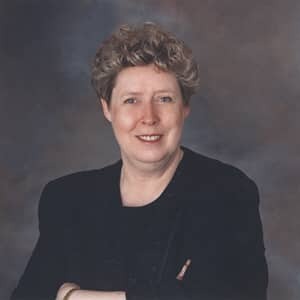 In addition to being an award-winning Accountant and QuickBooks Certified ProAdvisor, Diane Gilson has taught, coached, and advised thousands of QuickBooks users in the construction industry. In this program, Diane combines her 30+ years of accounting experience (including 15 years as a CPA) with her passion for job costing. Helping company owners, accountants and bookkeepers drive more profits through job-costing and better financial management has been the heart and soul of her business for more than 20 years. Note 2 – Consultants & Accountants: We love working with consultants and accountants, but please note that this product is NOT licensed for use to compute results for multiple entities. If you wish to utilize this product for more than one client, please contact us for helpful insights and discounted licensing arrangements. We appreciate your consideration regarding legal intellectual property rights…. If you look at the results above, you’ll notice that no single month reflects the true Total job profitability (30% for Job A and 25.5% for Job B). Each month, standing alone, shows wildly varying, and unrealistic, profit or loss. 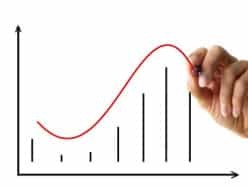 If you’re someone who really has a need to know how a job – or the company – is doing, this could create quite the emotional roller coaster! With all of the bills and checks and payroll and invoices and cash coming and going, it becomes extremely difficult to know how much you are truly EARNING on a day-to-day, week-to-week, and month-to-month basis on any specific long-term job. Of course, if you have a good job-costing accounting system you will eventually know your final results on any given job, but that’s far too late to take corrective action. AND if you keep a multitude of projects running at the same time, it can become nearly impossible to nail down your company-wide financial scores for any given time frame! Percentage of Completion adjustments to the rescue! 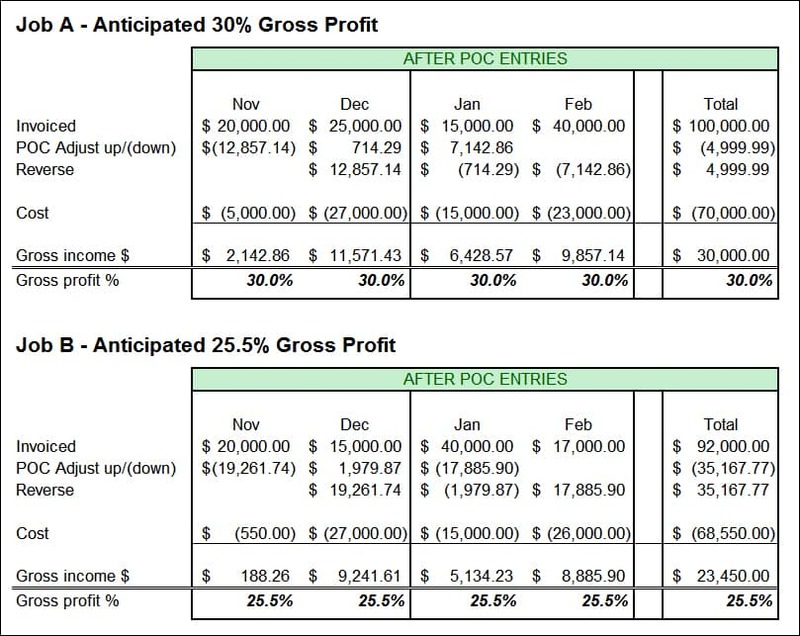 The ‘Percentage of Completion adjustments’ technique provides you with a stable, reliable way of matching each job’s life-to-date revenue against its life-to-date expenses so that you can know how this month’s or quarter’s profit “lines up” against last month’s, last quarter’s or last year’s. And if your job profitability reflects reality, your company-wide numbers will more clearly reflect reality. Various national consulting groups (so participants can compare true productivity and profitability with other participants). The IRS for businesses above a certain gross revenue level (see your tax advisor or this IRS article for specifics). NOTE: Regardless of tax reporting requirements, the percentage of completion method of accounting provides the best management information on longer-term jobs as it matches costs incurred with income earned. The POC method can be utilized for internal reporting purposes even if your tax advisor uses a different tax reporting method. As you undertake the discipline of helping to assemble your numbers for the Percentage of Completion calculations, you will become much closer to your critical numbers: estimated income and costs, change orders, allowances, and over/under-runs. You will gain a much deeper understanding of exactly how individual jobs are shaping up from a financial standpoint as they progress. And from there you will be able to quickly take corrective action to complete each job that much closer to “on time” and “under budget”. When owners and managers have access to accurate measurements, they automatically begin to take steps to improve their results! Yes, it will require a small investment to get your Percentage of Completion adjustments ‘up and rolling’, but the payoffs are significant. If you’ve experienced those fluctuating numbers, having to continually guess what’s still coming in the door for ongoing jobs, the ongoing disquiet of not knowing where you stand on a job until AFTER it’s completed, or the sense that finances are out of control because you don’t know where your company REALLY stands, it’s time to move these adjustment techniques and reporting improvements to the top of your list!